I'm a back row kind of girl. Classrooms, movies, you name it, I don't like to sit near the front. I'm very shy at my core, and to sit in the front of a room feels very vulnerable - I don't want to be noticed, I don't want to get called on, I just want to be a fly on the wall. Pretty much the only place I don't like sitting in the back row is on an airplane, and that is simply due to my exit strategy. After all, the whole reason I ever get ON a plane is so I can get OFF a plane, and if I'm sitting in the very back waiting to exit it's like trying not to pee myself while having my picture taken next to a waterfall after drinking 3 gallons of lemonade. I can't stand it, can't flash a real smile - all I'm really capable of is saying a prayer of gratitude that I no longer have to travel with small children. I am the same way with my Weight Watchers meetings. I weigh in, catch a seat in the back, then try to ignore people for the next half hour so I'm not delayed getting out as soon as it's over. I don't usually say much. ...there are certain perks to sitting in the front. 10:30 am - I leave for the gym. Incidentally, a mile from my house. 10:31 am - Cell phone rings. It's an 800 #. I ignore it. In hindsight, a poor choice. 10:32 am - Arrive at the gym and survey the possibilities - elliptical with TV or treadmill with iTunes? I opt for TV. I put phone on vibrate, stuff it in my jacket, and hang it on the coat rack. 10:50 am - potty break. The woman in the other stall is wearing too much perfume. It stinks. At about this time the police are arriving at my home and I have no idea. 10:52 am - blow nose, switch to treadmill, and judge the girl next to me who is working out in her nightshirt and flip flops. Try to take a subtle picture of her to post to facebook - dangit! too blurry. 11:07am - Follow physical therapist's instructions: Run 1 minute, walk for 30 seconds. Run 1 minute, walk for 30 seconds. Do this for a mile to gradually break in that calf muscle I tore four months ago. 11:28 am - Final trip to bathroom to wash hands - walk in on nightshirt/flip flop girl dancing in the mirror. It is all I can do to keep a straight face. Leave to retrieve jacket, check cell phone, NINE MISSED CALLS, 4 text messages, and two voice mails. I take it off vibrate, head to my car, and answer Cory's text first in response to his question, "where are you". I think he is just interested in making lunch plans, so I call him back and leave him a pleasant message on his work voice mail. 11:30 am - Jump in car as quickly as possible to avoid the torrential winds from blowing me to Canada. Cell phone rings - it's Cory. He's calling FROM HOME. "Honey? What are you doing home?" "Well, it seemed like the right thing to do when the security company called to tell me our alarm was going off and you were not answering the home phone OR your cell phone. I was worried." He also works not very close to home, and I know how busy he has been at work lately so suddenly I felt very guilty that I had, unknowingly, caused such a ruckus. What happened? After talking it through for a few minutes we figured it out. There's a system when I leave the house: turn on alarm, leave through house door, open garage, and exit. Today, apparently, the door from the garage into the house didn't fully shut when I left so when I opened the garage the winds (which again, were torrential today. Like, two hands on the wheel, don't bother doing your hair TORRENTIAL.) blew back open the door without me realizing it, rendering the alarm unable to engage. When this happens the alarm actually sounds, but I was halfway to the gym by then. I didn't know - they tried to tell me, hence the 800 # call that I ignored. So there I was, burning calories and watching people make the highest bid without going over and not only were the police on their way, but Cory called a neighbor to come check on me while he jumped in his car to make the half hour drive. "I was supposed to be going into a meeting," Cory explained, "but I knew I wasn't going to be able to concentrate." You guys, he chose ME over ACCOUNTING. I mean, I've had guys who didn't even choose me over Physics homework and reheated dorm food so forgive me if I think this is a big deal. Cory might say the moral of this story is to make sure the door to the house is FULLY closed before leaving through the garage. I say the moral of the story is He Loves Me. That and if you thing your dance moves are worthy of flaunting in a public bathroom mirror while wearing your nightshirt, think again. I don't want to blog. I want to write something brilliant. I don't care if I ever write again. I don't like Adele's music. I am happy for Adele's success. I don't think Meet The Parents was a funny movie. I think Zoolander was hilarious. I don't like reading sad stories. I have been reading Half The Sky. I want to do something meaningful. Watching Ellen do it is easier. I want to be an influence for good. I'm not sure that mocking the people on The Bachelor counts. I want cookies for lunch. I don't want to shovel the snow. I also want Cory's car to make it into the garage after his long day at work. I want Kate to confess her true feelings for Castle. I want HGTV to knock on my door and declare me the winner. I don't want to move to Utah. I want to NOT be sick for the eleventy thousandth time since Christmas. I want to fall asleep and wake up after the election is over. I want to hug my physical therapist. I want to stab my physical therapist in the eye. I want to be the best at something. I don't want to work that hard. I want to say something interesting. It's not always easy being me. "Humble Pie" should be a new flavor at Marie Callendar's. I've been eating a lot of it lately - perhaps it could be inspired by me, bear my namesake and then maybe I could finally get some free pie. Seems only fair. I thought it was enough that I was forced into menopause in my 30's. I thought it was enough that I had to buy a tube of Preparation-H, and not for a practical joke. I thought it was enough that I chipped my tooth ON A RAISIN. During my visit to the dentist to usher in my first crown of all time due to said raisin debacle, my dentist asked, "Did you know that you grind your teeth?" No, I didn't. "You're going to need a night guard," he added, "oh, and your insurance doesn't cover it." (And no more happiness!) They proceeded to take a mold of my teeth, but to stop there would be like telling a friend over a cup of coffee, "Oh, and then the Nazi soldier asked me to turn the shower head to the left *yawn*". No, to "take a mold" while following the instructions to "breathe" and "try not to gag" is like telling a bulimic to try and keep it down while staring at their index finger. In short, A VERY LONG TWO MINUTES. Last week I went to pick up the finished product. They shoved it in my mouth and declared it a good fit, "nice and tight" they said. I thought, "Good as in 'I can now sub for Laila Ali in a pinch'? or good as in, 'There's not a pheromone strong enough to overpower that this side of the Mississippi'?" Personally, I think it was a little of both, which means a) I may have a boxing future after all and, b) nothing bad can ever happen to Cory. Are you thinking it stops there? Silly Brett. As I got up out of my chair the dental assistant handed me the box and said, "You'll want to get some denture cleaner for that." Say whaaa...? "Yes, you need to soak it every night or else it will start to smell." Within minutes I was buying Fixodent with Scope at Target. To sum up: Betty White is in her 90's hosting SNL and getting Emmy awards, I am in my early 40's taking hormones and soaking my night guard in denture tablets. Now if you'll excuse me, I have to hurry up and get a nap in - Price Is Right is on at ten and Marie Callendar's is featuring a new pie tonight for their early bird special. 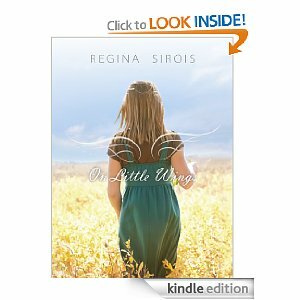 Using Random.Org the winner of "On Little Wings" by Regina Sirois is...lucky #13, "Yarbrough Clan"! Congratulations! Email me at vernmaster at gmail dot com with your contact information and we'll get that out to you ASAP. If you didn't win and would still like a copy, you can download it to your Kindle for only $2.99 right now through amazon. $2.99! That's like choosing between a Gatorade or a full on book (notice I didn't use Diet Coke or chocolate as my examples - I know my audience guys). Paperback versions are also available for around $10.95. Thanks for the free copy Regina! The first time it really snowed I was sick. The second time it really snowed I was sick. So I shoveled the driveway. WHILE I WAS SICK! The third time it really, REALLY snowed was today, and again, I am sick. The school district canceled school. So I am making the kids shovel the driveway so I can blog about cake. Divide batter - Pour 1/3 (approximately) into another bowl leaving 2/3 in main bowl. Defrost 1 cup frozen raspberries and mash them up with a fork. Add 1 Tbsp flour and mix. Add the mashed berries to the bowl containing 1/3 of the original batter and mix well. Set aside. Take 1 c. white chocolate chips and melt them gradually in the microwave. Add to remaining 2/3 batter and mix. Grease bundt cake pan well and coat bottom of pan with 1/2 of the white chocolate/cake batter mix. Add dollops of all of your raspberry/cake batter mix to the pan on top of the white chocolate batter. Then add the remaining white chocolate cake/batter on top of the dollops. To create the marble look, make an S pattern through the batter using a knife. Let the cake cool in the pan for a bit, then turn it out onto a cooling rack. IMPORTANT STEP: Place the cake in the fridge until it is COMPLETELY cool, then frost the bad boy with cream cheese frosting (recipe following). (NOTE: If you don't like cream cheese frosting, a nice vanilla buttercream is just as good.) After the cake is frosted, place the cake BACK in the fridge to cool the frosting again, and then serve it cold. It is a million, and I mean a MILLION times better cold. Mix butter and and cream cheese until soft, add 2 tsp vanilla, beat until light and fluffy. Add 4 1/2 cups powdered sugar, one cup at a time. Beat frosting until smooth. Add milk a tablespoon at a time until you reach the desired consistency. Add food coloring if you want. Voila - it's the perfect dessert for Super Bowl Sunday, or perhaps marking another basketball loss on a Saturday, any and all holidays, birthdays, movie nights, rare moments alone in your kitchen when everyone else is sleeping, or say, a snow day when you're in your underwear, and you're sick, and the kids are outside...shoveling the driveway.